Born: 8 April 1867, London, England. Died: 30 April 1933, Pretoria, South Africa. J. Donald Robertson was educated at St Andrew's School, London, and came to South Africa in 1889. During 1890-1891 he taught elocution and English subjects at the Collegiate School, Cape Town. At the same time he taught elocution at the Theological College and Seminary and the Bloemhof Ladies' Seminary in Cape Town, and at the Rhenish Institute at Stellenbosch. From 1892 to 1896 he resided in King William's Town, where he was confidential clerk to the firm of solicitors Robertson, Wiley and King. He married Elizabeth Ann Wright there on 10 September 1893, and they eventually had four children. In 1897 he became assistant town clerk and town treasurer of Port Elizabeth. That year he presented a collection of 825 birds' eggs from the King William's Town district to the Port Elizabeth Museum. Shortly after the Anglo-Boer War (1899-1902), in July 1902, Robertson was appointed town treasurer of Pretoria, in the Transvaal Colony. 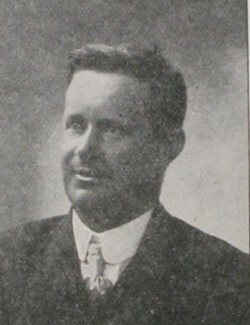 Some time after the formation of the Union of South Africa, in May 1912, he became both town clerk and town treasurer, but during the nineteen-twenties was again just town treasurer, a post he still held in 1927. In September 1924 he read a paper on "Municipal loans and considerations incidental thereto" at the 21st annual meeting of the Transvaal Municipal Association at Pietersburg (now Polokwane). The paper was published as a pamphlet in Johannesburg. Cape of Good Hope. Report on the Port Elizabeth Museum, 1897. National Archives Repository (TAB), Source MHG, Vol. 0, Ref. 4762/53: death notice, John Donald Robertson. National Automated Archival Information Retrieval System (NAAIRS). . Documents relating to Robertson, John Donald / Robertson, J. Donald. South African who's who, 1908, 1919/20, 1923/4, 1927/8.